It is true to say when perusing your local aquatic retailers that what you see is very rarely what you get. Well, in the long run anyway. Many fish, once settled in a home aquarium, away from the constant coming and going of a retailers tank, will show new colours and grow into new shapes and sizes. The iridescent shark is, unfortunately for the aquarist, very much this way. If it stayed as a 2" hyperactive stream of beautiful mother-of-pearl iridescent stripes then all would be well. The iridescent shark, so called because of its mid-water swimming style and similarity in terms of shape to its namesake, isn't, however, an aggressive fish. It is very, very nervous. This skittishness is further compounded if kept alone or in an unsuitably small aquarium. 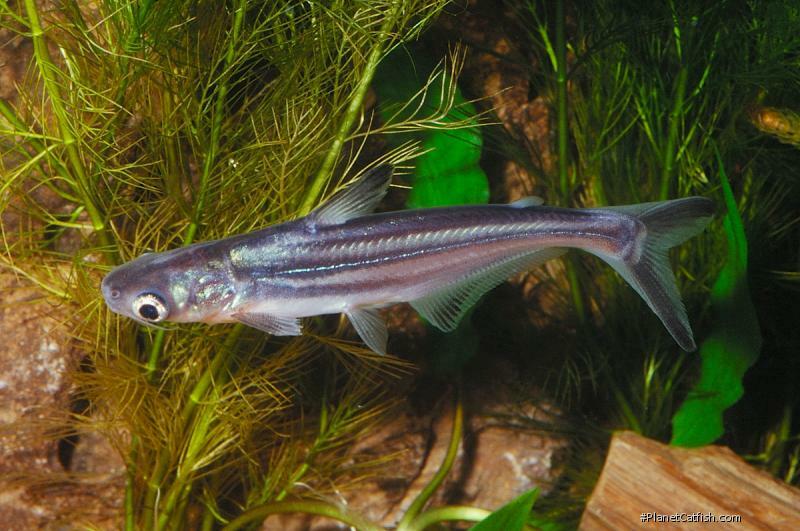 Because this fish is very active, it can also stress more timid or slow moving fish in the same environment. Thus care should be taken to keep it with other "fast-lane" fish. Typically offered for sale at less than 2", a shoal of around 5 individuals of this size will settle into a 3ft aquarium. They will need the entire tank for swimming space, but they will settle. Rapid growth ensues, for they have voracious appetites; the group will become increasingly unsettled. They will attempt to leave the aquarium by any possible route and can damage themselves severely by swimming into rocks or the aquarium walls in a top speed panic with no self regard whatsoever. All fish of their family (Pangasiidae) have no scales and will scratch and scar themselves on anything other than the smoothest of surfaces. As they approach the 8" mark you will need a big tank for a shoal of these fish. Now, remember what I was saying about what you see is what you get? Apart from these fish getting larger and much more solidly built, they also lose their iridescent stripes, ending up much more like real sharks ( i.e. in terms of the classic shark two tone grey back, white underside colouration). I have yet to see how the albino colouration of this species changes with increased size. For catfish they are very active and always on show, just don't creep up on the tank in darkness and suddenly switch the light on! And finally, a nomenclature note: Roberts in his "Systematic Revision of the Asian Catfish Family Pangasiidae with Biological Observations and Descriptions of three new spp." lumped P. hypophthalmus (Savage, 1878) in ith P. sutchi (Fowler, 1937), the former now being the accepted correct scientific name. Because this revision was only published in 1991, many books out there still label this fish as P. sutchi. More recently (2009) this species was moved back into the genus Pangasianodon. Etymology The generic name is derived from Pangasius + an (Greek for without)+odon (Greek for tooth); in reference to the toothless state of the adult fish. Size 1300mm or 51.2" SL. Find near, nearer or same sized spp. Identification An albino variety is also, commonly, available. Sexing Males have darker stripes and are more slender than females. It is unclear at what stage this becomes evident. Distribution Southeast Asia: Known from the Mekong, Chao Phraya, and perhaps Mekong basins (Thailand, Laos, Kampuchea, and Viet Nam). Introduced into additional river basins for aquaculture. Feeding Youngsters are more carnivorous than adults. Bloodworm and catfish tablets are best at first, moving onto shrimp and spinach cubes as the fish get larger. Ultimately any primarily vegetable based floating pellet foods. Furniture As little as possible, this fish needs space. Floating plants will reduce this fishes skittishness. Compatibility Peaceful; can be kept with smaller fish, although this fishes extreme nervousness will affect what fish you can keep with it. Suggested Tankmates Large active fish, the bigger barbs, Labeo ''sharks'', Loricariids, Pacu. Breeding Unknown and probably impossible in the confines of a home aquarium. 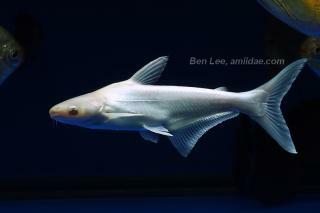 Is commercially bred for the aquarium trade in large ponds. There are 75 registered keepers, view all "my cats" data.